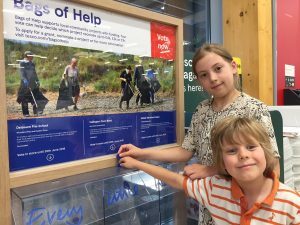 Esme and Seth Blaze show their support for Callington Town Band’s Community project, ‘And Some Came Home’, when they put their tokens in the Town Band ‘Bags of Help’ slot at Callington Tesco. With just a week or so to go they are hoping that the Town Band, in which both their parents play, will be a worthy winner. And remember that you can support the project in other ways by coming along to the first Singing Workshop in Callington Town Hall at 10am on July 21st or by volunteering to act. Contact Shirley Morse (01579 360336 or shirleyamorse@gmail.com) for more information. This is the first event in the re-running of ‘And Some Came Home’, the successful community commemoration of WW1 that was first performed in 2014. With a cast of local singers, actors and musicians the 2018 performances will take place in the Town Hall on October 26th and 27th with free admission. This entry was posted in Callington, Clubs/Groups, Culture, Events, History, Music on June 15, 2018 by SAS.